If you’ve been committed to a healthy diet for a while, you probably know at least one person swearing to “eat better” in 2014 – and you probably also know that New Year’s resolutions rarely last past the 2nd week of January. In fact, you might even feel a surge of uncharitable resentment at the newcomers who swarm the gym on January 1st, tying up the equipment you wanted to use for the sake of their yearly week of “getting healthy” before they go right back to the couch. 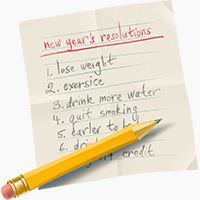 Most resolutions fail because they’re both vague and unrealistic (“eat healthy,” “get in shape”), or because they’re a resolution to “do” something that’s not actually under your control (“lose 50 pounds”). Don’t listen to their resolution to “lose some weight” or “eat right” and internally write it off as a failure. Don’t immediately launch into a self-confident lecture on goal-setting and how they’re doing everything wrong. Do listen to their lousy resolution and ask targeted follow-up questions. The ultimate goal is to guide them towards a good resolution: something specific, realistic, targeted, and focused on behavior they can control rather than outcomes that they can’t control. Resolving to “go to the gym 3 times a week for Kickboxing classes” is far and away better than resolving to “get in shape” (what’s “shape”? How will you know when you get there? How are you going to make it happen?). With smart resolutions, your friends have a much better chance at actually keeping them. A. Call back to give your friend a doctoral dissertation on the nutritional shortcomings of her meal. B. Pretend you didn’t get the message. C. Congratulate her for starting, briefly note that she might want some more protein with that, and send her a recipe for mini frittatas. If you picked C (or some variation of it), congratulations: you’re well on the way to helping everyone around you get a little healthier. No, it doesn’t educate your friend about all the other problems with her meal. But your friend isn’t ready to think about that yet. What she needs is emotional support to keep going, and a simple suggestion for improving her meal based on something she already understands (like protein) rather than something complicated and difficult to grasp (like Omega-6 fats). Be aware that in practice, it’s very difficult to avoid overwhelming people with information and criticism. It seems so obvious to you. But it’s not obvious to them. Work with your friends on their level, and you’ll see a much higher rate of long-term success. It’s always exciting when someone you care about decides to start taking responsibility for their own health, and it’s always flattering when anyone looks to you as an “expert” tor advice and encouragement. This makes it all too easy to let your enthusiasm for their progress take over your entire relationship with the person. You used to talk about all kinds of things; now it’s all gym talk and nutrition tips, all the time. You used to get together for coffee, for book club, or just for fun; now all your conversations happen in the locker room or on the stretching mat. The problem with this approach is that statistically, your friend is very likely to fail at their resolution no matter what you do. And if that happens, all your mutual activity will suddenly end as well, making it very difficult to keep the person as a friend. The solution: make sure you stay connected through activities totally unrelated to the resolution, and don’t let a failed resolution wreck your friendship. If fitness or healthy eating is a huge part of your own lifestyle, it’s easy to assume that the other person wants to make it just as big a factor in their own life: why wouldn’t they? But some people just have other priorities. They want to improve their health, but they aren’t necessarily interested in doing everything you do. For example, maybe your goal is optimal health – but when your brother decides to take the plunge, all he wants is weight loss and maybe some improvement with his sinus headaches. Your brother can achieve his goal without putting in 110%, so chances are he’ll be a lot less dedicated to optimizing every aspect of his lifestyle, especially the little things that don’t really relate to his goal. His goal is not your goal. But his goal is also totally fine – don’t try to pressure him into following your program or putting in as much blood, sweat, and tears as you do. Some people just aren’t ready to break out of the “2-week resolution” cycle, and there’s nothing you can do to prevent it. Nagging them will just damage your friendship. You’re not their mom, their PE coach, or their drill sergeant; it’s not your job to control their behavior past the point of friendly encouragement. Your friend keeps making excuses for why they can’t show up. When they do show up, they’re not enthusiastic or positive about what they’re doing. Your friend suddenly stops wanting to talk about their goal with you, and keeps trying to change the subject when it comes up. If your friend is dropping the ball like this, there’s really not much you can do: turning up the pressure is likely to wreck your relationship without having any effect on their behavior. Let it drop (but don’t let them drag you down, too! ), and remind yourself that you liked the person before they made the resolution, and that you can still have a good relationship even if they decide to be a vegan and never set foot in the gym again. Help your friend set smart goals. Don’t let it dominate your friendship. Don’t project your own goals onto your friend. There’s no guarantee that doing these things (or anything else) will make your friend succeed where so many other people fail. But with your encouragement and advice, they have a much better chance of making changes that stick – and even if they ultimately go back to their old diet, they’ll always remember that you were there for support.